JUN 13, 2018 — Your advocacy worked! Read our statement on the exciting result of our statewide budget campaign. Advocates, legislators, social justice partners, and everyday Californians worked hard to make this happen. We are incredibly grateful for your support, and encourage you to continue engaging with the movements to end sexual and domestic violence. “This is an important step forward, at an historic moment for the movement to end gender-based violence. Although the final funding differs from our original $50 million ask, we recognize that the budget process involves a series of complex negotiations reflecting the core values and priorities of our state. Successfully advocating for a substantial increase in funding, at a time when the state budget is under tremendous demand, is a victory that we can be proud of. This is a move toward greater equity in services for sexual assault and highlights prevention as key in responding to and ending domestic and sexual violence! Specifically, we are proud that this is the first time the State of California has approved an increase in funding to address sexual assault. 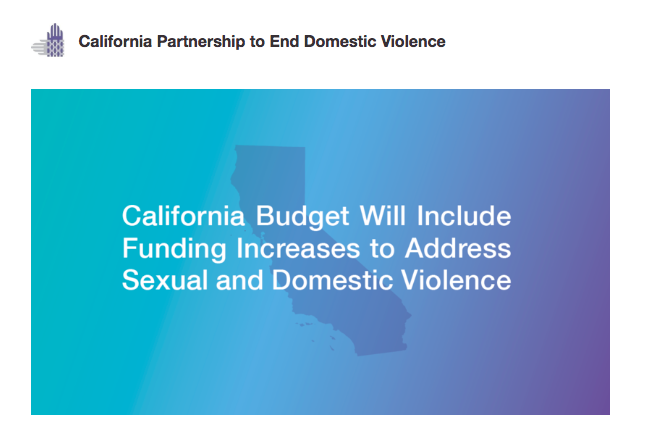 However, this budget success does not address the disparity in funding between sexual and domestic violence services, and still falls short of our goal of ongoing funding. We must continue to increase access to funds for community-based and culturally-responsive approaches. CALCASA and the Partnership are committed to working with legislators to leverage opportunities and resources for lasting change in our state, and we’ll stand together next year to advance these solutions. Our two coalitions are extremely proud of our collaboration, recognizing that we truly are stronger together! We remain committed to leading with prevention, expanding resources for survivors of domestic and sexual violence, and resourcing research and evaluation.